Classic selections from the Great American Songbook, sung by a man who paid his dues long ago and knows how to sit back and recount all those sad and beautiful stories of love won and lost. Michael Alan Butler has seen a lot of life from the business end of blues bars around the Pacific Northwest. So much so that his doctor advised him to give it up or die. So he took a day job and turned his musical attention to the classic songs he grew up listening to Sinatra and Ella sing. But while you can take the man out of the smoky dive, you can't take the smoky dive out of the man's voice. In that voice one can hear all the pain and joy of a life lived hard and honestly. 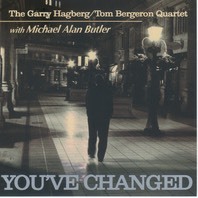 MAB is featured with the Garry Hagberg/Tom Bergeron Quartet on their second outing (following their debut CD Jobim Now). The classic songs are dusted off and refurbished with grooves befitting a quartet whose collective interests include jazz of all persuasions, blues and R&B, Afro-Cuban/Afro-Brazilian music, and beyond. Cameo appearances by two veterans and two brilliant young artists help make this a set of tracks that will cause you to forget these songs were written half a century ago. Or maybe it will remind you what a golden age of songwriting that era really was. Michael Alan Butler has been a fixture in the Pacific Northwest music scene for over 40 years. Michael, in fact, has been making music since he first picked up that accordion in the mid 1950s and fell in love with performing. Raised on a diet of jazz, R & B, and rock, Michael soon expanded his range of interest to include soul, blues, folk and country, even bluegrass. From garage bands to coffee houses to touring funk groups, he's played and sung it all since his first gig in 1964 at the age of 14. In the early 1970s Michael fronted the legendary Eugene R&B ensemble Ouroboros, providing vocals and horn section work for the only rock group to ever replace the University of Oregon marching band at Autzen Stadium. Ouroboros played every home game for one entire football season. He has the pictures to prove it! About the same time, Michael was fortunate enough to study jazz vocals with Nancy King who taught him the art and science of skat. Of all the musical genres he's absorbed, the medium of jazz, Mr. Butler tells us "is and always has been my favorite." Eventually, Butler hit the road and toured the Western US, Canada and Alaska over the next couple of decades, playing drums and singing in so many bands there's a list "as long as your arm." In 1987 Michael recorded one of his own songs the old-school way — as a 45 record. This 45 hit the national Top 100 charts for a week or two. His dense and lengthy history on and off the road can be heard now in a voice rich with experience. Through it all, Michael has maintained and refined his interest in jazz which finds him here and now, lovingly interpreting some classic jazz standards on You've Changed. Michael Alan Butler puts it all to the table every time he gets up to sing. You can't ask for more than that.